Awaken a fatigued eye area with the Hydro Cool Firming Eye Gels from skyn ICELAND. Working within ten minutes, the cooling under-eye gel patches work to visibly firm and de-puff the delicate eye area, resulting in a youthful appearance. Ideal for when you’re stressed or run down, which can lead to dark circles, puffiness and premature wrinkles. The anti-ageing gel patch enriches the eye area with highly potent actives and Icelandic glacial water, which work harmoniously to visibly firm skin and reduce the appearance of fine lines and wrinkles. Expect younger looking eyes that are bright and revived. Free from harsh chemicals, parabens, PEGs, formaldehyde, silicones, sulphate detergents, fragrance, and dye. 100% Vegan. Dermatologist tested. 2017 Good Housekeeping Beauty Lab Award Winner in Top Tested Eye Skincare (also featured in the May issue, on stands now! Also, 2015 Good Housekeeping Lab Test Winner for Instant Eye Revivers. Remove backing and apply gel side to under eye area for ten minutes. 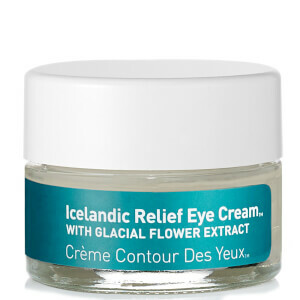 After treatment, gently peel away patch and follow with Icelandic Relief Eye Cream. Use once a week or whenever you need a quick fix. Water/Aqua/ Eau, Polyacrylic Acid, Glycerin, Olea Europaea (Olive) Fruit Oil, Angelica Archangelica Root Water*, Sodium Hydroxide, Ginkgo Biloba Leaf Extract, Acetyl Hexapeptide-8, Hydrolyzed Extensin, Agar, Caprylyl Glycol, Perfluorodecalin, Simmondsia Chinensis (Jojoba) Seed Oil, , Xanthan Gum, Ubiquinone,Thymus Vulgaris (Thyme) Flower/Leaf Extract, Buddleja Davidii Extract, Rubus Chamaemorus (Arctic Cloudberry) Seed Oil, Oxycoccus Palustris (Arctic Cranberry) Seed Oil, Aluminum Glycinate, Polysorbate 60, Ceramide NP, 1,2-Hexanediol, Sucrose Palmitate, Potassium Sorbate, Sodium Benzoate * Component of Icelandic Glacial Water.